Today I am guest blogging at At Home With Books. The topic: the best and worst works of an author. Of course, seeing that nobody had done Stephen King, I jumped at the chance. There is little doubt that Stephen King is an outrageously successful author, nearly every book he has written has been a runaway bestseller and several of his novels have been made into movies (from the excellent The Shawshank Redemption, The Green Mile, Misery, and Stand by Me, to the average The Secret Window, The Mist, and Hearts in Atlantis, to the laughable Lawnmower Man and Maximum Overdrive). King, however, still remains a rather polarizing writer in regards to the question “Is he actually any good?”. For a “constant reader” like me, the answer is yes. I do think he is good, sometimes great, nearly always entertaining. As a writer who once famously compared himself to being the literary equivalent of a big mac and fries, I think he does his work (and his fans) a disservice. 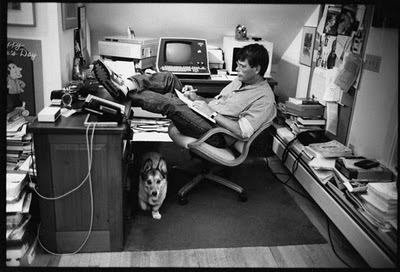 While he is certainly not the greatest contemporary writer, I do believe 100 years from now people will look at Stephen King as an authorial giant of our time. I would further venture to say that one of the most popular misconceptions of the author is that he writes nothing but horror and violence. Certainly, he writes horror stories, but he has also written mysteries, thrillers, dramas, and the occasional love story. I hope my best and worst list will either reinforce your cultural reverence for Stephen King or convince you to reconsider one of Stephen King’s works that you had previously dismissed. I know he is not for everyone, but I am firmly convinced that there is at least one book that people might enjoy…. To read the rest of my defense and to view my recommendations, please head over to At Home With Books. Photo: 3.bp.blogspot.com, original source unknown. *I am updating to include this post as my favorite discussion post of the week. If you are stopping by from the blog hop on Crazy for Books, the full article is a guest post on another blog (click to read the whole thing) and I would love is you commented on my or Alyce’s blog!